It’s the holiday season, the house is decorated, the Christmas tree is majestically enthroned and adorned with a host of decorations, each more beautiful than the next. The children’s eyes dance with joy and the eyes of Kitty and Fido are filled with surprise! * I won’t hang dangerous icicles and angel hair on my Christmas tree because my pet likes to swallow them, which often causes serious obstructions. * I will attach my tree solidly so it won’t fall over if Kitty climbs on it, because she could be seriously injured, so I’ll make sure she doesn’t play near the tree. * I will camouflage all of the electric wires and make them inaccessible to prevent my pet from chewing on them and risking electrocution. * I will decorate the tree with unbreakable Christmas ornaments that stand up to many assaults. * I will eliminate breakable ornaments or hang them high in the tree. * All of the decorations will be safe and non-toxic. * I will eliminate the small and miniature decorations that can be easily swallowed, or I will hang them high in the tree. 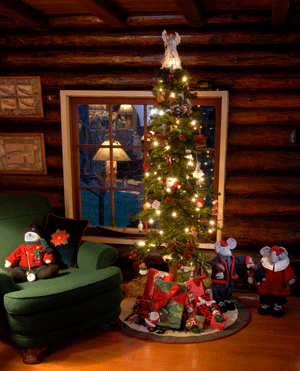 * I will put the gifts under the tree at the last minute, ideally after Santa Claus has left his. I will remove all of the wrappings as soon as the presents have been unwrapped so that my pet won’t play with it and risk injury. * I will prevent my pet from eating the Christmas plants (poinsettia, holly…), since they are toxic. I will place them high out of reach. * If, despite all my precautions, my pet doesn’t feel well, or if I have questions or doubts about which decorations to avoid, I will call my vet, who will give me advice that will help us enjoy a happy and worry-free Christmas season. In conclusion, I know that moderation is tastes better! So, since table scraps are not healthy for animals, I won’t give my pet any. I will also mention this to my guests. After all, it’s gratifying to see the turkey I slaved over all day disappear quickly from their plates, but less so seeing it disappear under the table!